Ingjard is a Nord warrior found in Fort Dawnguard. She is clad in a set of Dawnguard equipment. This includes the cuirass as well as matching pairs of gauntlets and boots. 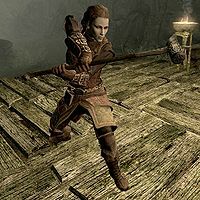 She is equipped with a Dawnguard warhammer and a crossbow supplemented with 15 steel bolts. She carries random leveled bandit loot, and has a 25% chance of carrying 1-9 gold. After you join the Dawnguard, Ingjard can be recruited as a follower. She has no maximum level and will continue to level up with you. She won't appear at Fort Dawnguard until the conclusion of the quest Prophet. Esta página foi modificada pela última vez à(s) 18h55min de 20 de março de 2014.